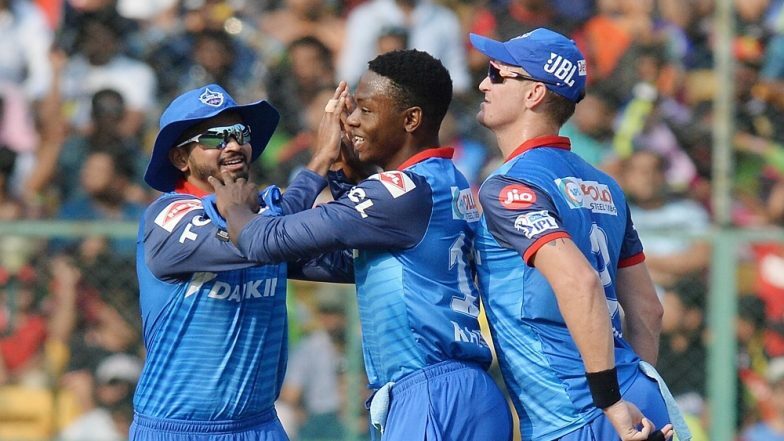 Bengaluru, April 7: Kagiso Rabada scalped four wickets as Delhi Capitals restricted Royal Challengers Bangalore (RCB) to a modest 149/8 in 20 overs in their Indian Premier League (IPL) encounter at the M. Chinnaswamy Stadium, here on Sunday. South Africa pacer Rabada (4/21) bowled a brilliant 18th over to snare three wickets, including the one of home team skipper Virat Kohli, to stem RCB's run flow. In the final over, he gave away just seven runs. Kohli top-scored with a patient 41 off 33 balls (1x4, 2x6) but other batsmen let him down. Kohli was also starved of the strike for most of his innings as Delhi were in control throughout the innings, barring the 18 deliveries when Moeen Ali made 32. RCB were off to a stuttering start, losing opener Parthiv Patel (9) early as the in-form stumper batsman slashed at a wide Lamichhane (1/46) delivery to Chris Morris at third man. AB de Villiers (17) failed to continue the fireworks from the last game and handed a catch to Colin Ingram at long on off Rabada. Marcus Stoinis (15) hit a six and looked good during his stay at the crease, but the Australian too tried to get a move on too early off Axar Patel (1/22), pulling a outside off-stump delivery to Rahul Tewatia at long on. Kagiso Rabada Told Me it Will Be 6 Yorkers, Says DC Skipper Shreyas Iyer. Ali and Kohli then joined hands for a 37-run stand for the fourth wicket with the latter looking in a fine touch. England all-rounder Ali smacked a four and a six off Ishant Sharma in the 14th over and hit Lamichhane also for a maximum in the next, before being foxed by a googly in the same over and coming down the wicket to smash a six, missing the line and Rishabh Pant stumping him with ease. Kohli, holding one end up all this while, decided to cut loose with the score reading 114/4 after 16 overs. The Indian captain smashed Lamichhane for two successive sixes but Rabada got his back in the next over, beating Kohli for pace as he looked to lift the ball over the bowler's head. Shreyas Iyer, Kohli's opposite number, took the catch at long on. Rabada then removed Akshdeep Nath (19) and Pawan Negi (0) in the same over to reduce the hosts to 138/7, from which they never recovered. Brief scores: Royal Challengers Bangalore 149/8 (Virat Kohli 41; Kagiso Rabada 4/21) vs Delhi Capitals.